Trail 70 update: it’s all coming together. Finally! With just two trips to the county clerks office I managed to snag a plate, and a title coming in the mail. As of right now, it’s been cleaned up, had the wheels powder coated blaaaaack, and gotten new Kenda scooter tires, a piranha 140cc motor, a side pipe, BMX style bars, and I attempted a skateboard seat. It Looked good, but it was utterly unrideable. Let’s just say, too much vibration. Hopefully by this weekend I’ll be getting new piggyback rear shocks in gold and black, a full compliment of LED based lighting, and a set of gold anodized inverted forks with a hydraulic disk brake. 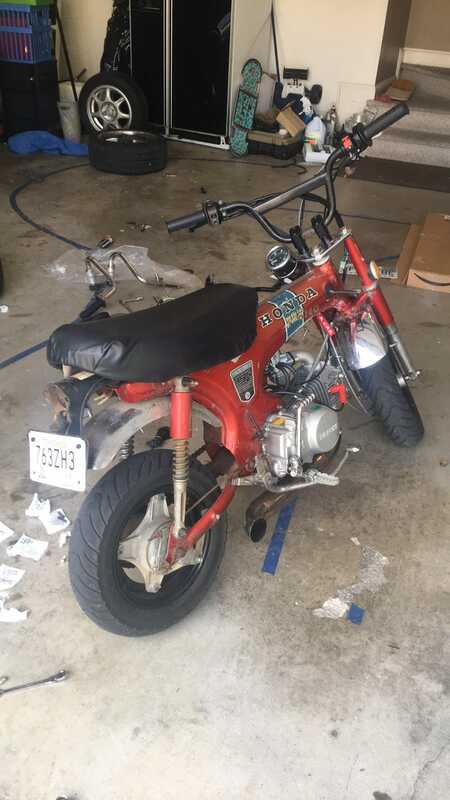 My tiny little pseudo-grom is finally getting rideable!